Cooking Delights: Let the Cleanse Begin! I have never done a cleanse before, but with two weeks off and only one yoga class to teach each week, now seems like a pretty good time. I have always wanted to do a cleanse, but I waited until I was done my dissertation. 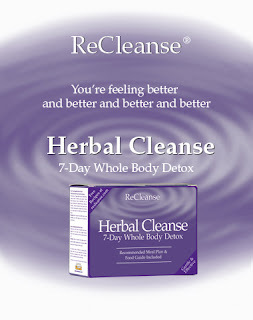 On the advice of my nutritionist pal, Vilma, I decided to try the ReCleanse gentle cleanse. You can eat on this cleanse, it is just quite restricted. No white flour, sugar, white potatos, yeast... you can pretty much eat fruit, veggies, some grains, and proteins. This morning started with the juice of half a lemon in a glass of purified water. This I could definitely add to my daily regime. I love lemon in water. My hubby on the other hand had a hard time choking it down. The lemon water was accompanied by two colon cleanse tablets. For breakfast this morning I had oatmeal with two tbsp. of walnuts, seasoned with cinnamon and nutmeg. No (soy) milk, no brown sugar or maple syrup. After breakfast we went grocery shopping for some interesting ingredients: kombu, kelp, braggs, quinoa, brown rice, mung beans, adzuki beans, almonds - all of which will be staples over the next seven days. We were pretty late getting back from grocery shopping so I whipped up this heavenly sprouts salad. It was dressed with an interesting combination of tomato juice, lime juice and olive oil. We the salad with one slice of organic spelt and wild rice bread (no yeast) garnished with Dreena's awesome hummus. The secret ingredient is 1/2 tsp. of sesame oil. I can see this hummus becoming a staple over the next few days. After cleaning up lunch I continued in the kitchen by making Dreena's quinoa casserole. I roasted red peppers, zucchini, and anise to top the leftover hummus and freshly made quinoa. I feel achy, cold, and a little hungry and irritable. I am disappointed by the lack of movement through the colon, but maybe there will be more action there tomorrow. I would love to have a plate of cheese and crackers, some home made nuts and bolts or a cup of earl gray tea with the home made shortbread my Mom made me. Other than that, I survived day 1/7. I have seen this Detox program before...interested in learning more. I am back bloggin' btw. Missed ya! Hope you feel better...don't you just love Dreena's Quinoa dish? I do~! Good Luck with the cleanse let me know how it goes ... hope you are having a great week post christmas! Stick with it, I'm sure it will get better. I haven't done a 'cleanse' but my bf and I did Dr Joshi's 3 week Holistic Detox, which is based on eating alkaline foods instead of acidic foods, to rebalance your body's ph. It was hard at first, but it got easier. And it made us feel sooo good at the end. We are planning on doing it again in a few weeks. It's funny how you will start to really enjoy fairly plain things, like lemon water, as your body cleanses. I ate the best salads on my detox; romaine lettuce, avocado, chicken, and green onions, dressed with olive oil, honey and lemon. So simple, but so good. And I started to re-love bananas, the only fruit we were allowed to have. Hi harmonia, glad to see you back blogging. I plan to post about the cleanse each day, so stay posted. Hi Nancy, definitely try the quinoa dish, I passed over it a number of times, but now that I've tried it, it is one of my favourites. Hi Marisa, I'll look up that bread recipe for you. Hi Jewell -Cleanse is going well, enjoying some post-Christmas down time. We painted the kitchen yesterday - living room today. Hi Judy - a 3 week cleanse! Wow! You are a champ. I like to eat a more alkaline diet, but living in Canada I find it more difficult in the winter. There are various online sources to provide you informative details on FDA approved weight loss pills as well as information on pills and tablets available in the pharmaceutical market that are capable of successfully relieving you from the grip of erectile dysfunction and depression. But the online pill destination http://www.pill-care.com is somewhat unique as it makes a whole array of information available to you, including details on the highly popular pills and tablets, testimonials as well as news on the latest tidbits of the pharmaceutical market. Log in to the website and get hold of relevant pill-care details.